New York is on my bucket list of places to take Peyton when she gets older. 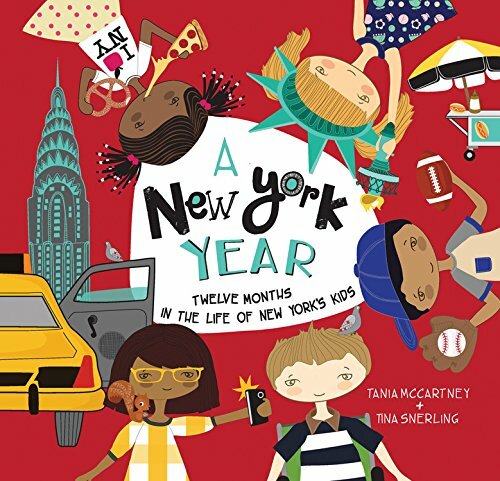 But until then, we can read A New York Year Twelve Months in the Life of New York’s Kids by Tania McCartney. The first few pages of A New York Year we meet some New York children that are going to help tell us about the twelve months of the year. Fabian, Madison, Jayla, Sofia and Alexander all live in New York. Each child tells us about their interests and what they would like to be when they grow up. What I found interesting is how each child’s passion translated into the career they aspire to have one day. New York has very similar weather patterns to our home state, Minnesota. So the weather was very similar to ours. We actually had many similarities to New York children like building snowmen, or having snow days from school. But there are also some difference like taking a subway to school! We do not have a subway system in Minnesota. Peyton wanted to know more about it. As we moved through the months Peyton kept commenting how similar we all were. And we are! While there are some subtle difference and a few landmarks we do not have in Minnesota for the most part New York children have similar experiences. They grow pumpkins just like we do! And then carve them into jack-o-lanterns. During the fall, their trees turn orange, red and gold. Just like ours! One of our favorite fall activities is to take a boat ride down the river and take in the colors of the leaves. New York kids like to rake together a pile of leaves and jump in them! We do too! The last few pages of the book tell us some facts about New York. Did you know New Yorks bird is the Eastern Bluebird? We’ve never seen an Eastern Bluebird so Peyton made me google it for a picture. The last few pages are perfect for learning about the state facts and which states border New York. A New York Year Twelve Months in the Life of New York’s Kids is available in your local bookstore or online.